Opponents of the health care law said Congress' power to regulate commerce didn't extend to people who choose not to buy something; the court's conservatives disagreed. Chief Justice John Roberts did decide, however, that the law was a legitimate use of the congressional power to tax. NBC's Pete Williams reports. Updated at 11:55 a.m. ET: In a dramatic victory for President Barack Obama, the Supreme Court upheld the 2010 health care law Thursday, preserving Obama’s landmark legislative achievement. 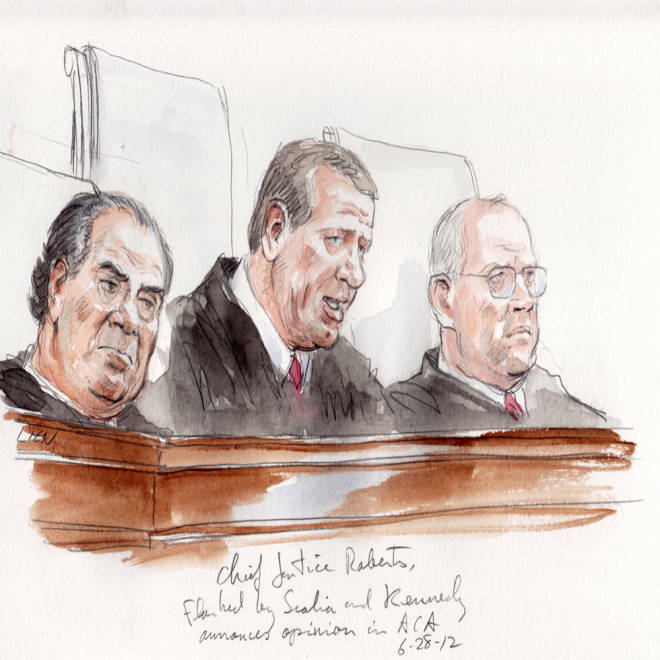 Roberts re-framed the debate over health care as a debate over increasing taxes. Congress, he said, is “increasing taxes” on those who choose to go uninsured. 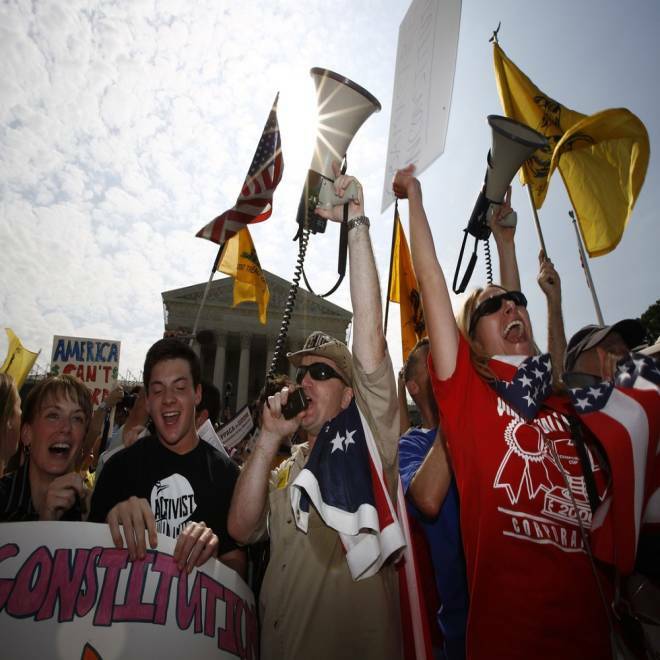 Poll: Do you agree with Supreme Court ruling on health care law? Tom Goldstein of the SCOTUS blog breaks down the Supreme Court's ruling on health care. Also, when asked why Chief Justice John Roberts upheld the law, Goldstein said, "I think he believed it." The 2010 law, the Affordable Care Act, requires non-exempted individuals to maintain a minimum level of health insurance or pay a tax penalty. • “The Affordable Care Act is constitutional in part and unconstitutional in part,” Roberts wrote. 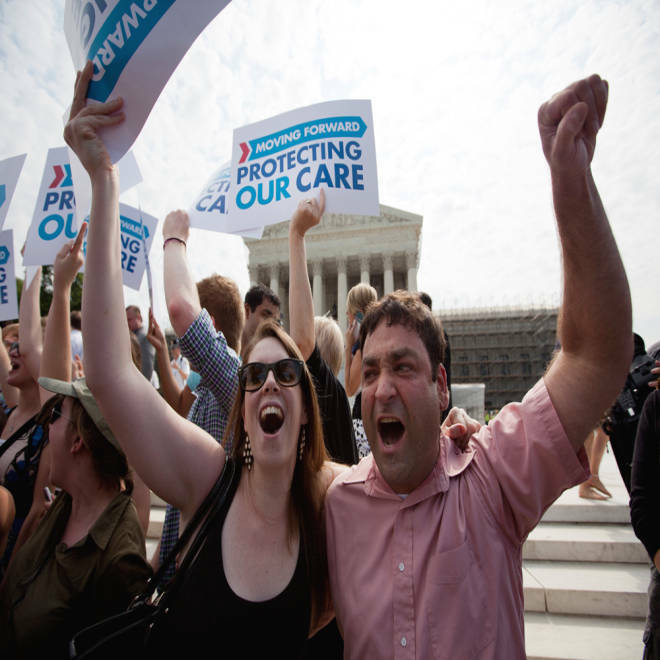 In a landmark ruling, the Supreme Court upholds President Obama's national health-care insurance act. NBC's Pete Williams reports. TODAY's Matt Lauer discusses the ruling with NBC's Savannah Guthrie and David Gregory, host of "Meet the Press." A sharply divided Supreme Court on Thursday upheld the centerpiece of Obama's signature healthcare overhaul law that requires that most Americans get insurance by 2014 or pay a financial penalty. Claire McAndrew of Washington, left, and Donny Kirsch of Washington celebrate outside the Supreme Court in Washington, D.C., Thursday, after a the court's ruling on health care. The four justices joining Roberts in upholding the law were Justices Ruth Bader Ginsburg, Stephen Breyer, Sonia Sotomayor and Elena Kagan. The dissenting justices were Justices Antonin Scalia, Anthony Kennedy, Clarence Thomas and Samuel Alito. For individuals who choose to not comply with the individual insurance mandate, Congress deliberately chose to make the penalty fairly weak: only $95 for 2014; $325 for 2015; and $695 in 2016. After 2016, that $695 amount is indexed to the consumer price index. Congress specifically did not allow the use of liens and seizures of property as methods of enforcing the penalty. Non-compliance with the mandate is also not subject to criminal or civil penalties under the Tax Code and interest does not accrue for failure to pay the penalty in a timely manner, according to the congressional Joint Committee on Taxation. NBC's Pete Williams reported that Roberts reasoned that “there’s no real compulsion here” since those who do not pay the penalty for not having insurance can’t be sent to jail. “This is one of the scenarios that administration officials had considered that if the court did this they would consider it a big victory,” Williams said. But in a major victory for the states who challenged the law, the court said that the Obama administration cannot coerce states to go along with the Medicaid insurance program for low-income people. The financial pressure which the federal government puts on the states in the expansion of Medicaid “is a gun to the head,” Roberts wrote. “A State that opts out of the Affordable Care Act’s expansion in health care coverage thus stands to lose not merely ‘a relatively small percentage’ of its existing Medicaid funding, but all of it,” Roberts said. Congress cannot “penalize States that choose not to participate in that new program by taking away their existing Medicaid funding,” Roberts said. The Medicaid provision is projected to add nearly 30 million more people to the insurance program for low-income Americans -- but the court’s decision left states free to opt out of the expansion if they choose.